This page is a translated version of the page Wirt and the translation is 100% complete. Wirt was founded in 1894, and for about twenty years was the biggest world fountain pen manufacturer, well above the production numbers of more famous brands like Waterman and Parker. In the initial period of fountain pen development the company was very innovative, mostly in the field of feeders. The company fate is substantially related to that of the founder family, Paul E. Wirt. His son, who was taking over from his father in running the business, died in 1921, and only after four years Paul E. Wirt went out of business by selling the company. The company remained active for a short time in the production of plastics, but the great depression of 1929 led it to a premature end. The Wirt company was founded in Bloomsburg, Pennsylvania by Paul E. Wirt around 1884 as a family business, even if the founder, a lawyer by profession, became involved in the production of fountain pens since 1880, obtaining his first patent in 1882. In the early years of fountain pen development Wirt was without a doubt one of the most active and advanced manufacturer, and together with the Holland was disputing the market leadership, proclaiming in 1890 in its advertising (there is a note on Ainslee's Magazine) the sales of more than 350,000 pens. 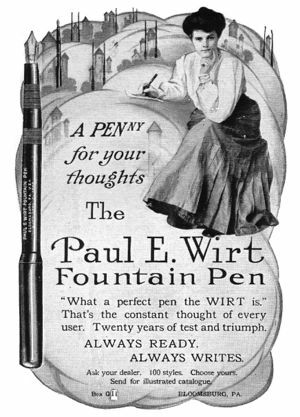 In 1925 the company was officially incorporated under the name of Paul Wirt Pen Co., and that same year Paul Wirt went out of business selling his share of the company. The activities continued for a short period terminating after a few years. 1925 the company is incorporated ad Paul Wirt Pen Co.
↑ we don't have the patent number but here is cited the date October, 11 1882. This page was last edited on 8 July 2017, at 21:05.